This Saturday, September 21st the American Association of University Women Northville-Novi Branch will be putting on their annual Tour of Homes. From 10am-4pm you can visit 6 homes with construction and interior design spanning 3 centuries in and around Historic Downtown Northville. Compare classic Victorian-Era architecture to that of today’s. Each home will have representatives from the AAUW to guide you through and point out interesting facts and features. All for just $20! For more information, visit the AAUW’s site here. Located adjacent to Ford Field Park in downtown Northville, Mill Race Historical Village is a charming enclave of preserved 19th century buildings along with a couple of accurate reproductions. The site was originally a grist mill and then later a Ford factory. In 1972 the site was donated to the City of Northville. You enter Mill Race by crossing a rustic wooden bridge. There are different styles of homes and buildings including a school, church, and several homes. The setting is quiet, slow, and immensely calming as the history of each structure walks you backwards in time. I’m reminded of Greenfield Village but on a vastly smaller scale and without the crowds and rides. Community features like this help make living in Northville so enjoyable. From nearby homes, you can walk to places like Ford Field Park’s play structure and fields, downtown shops and restaurants, or stroll through an architectural museum. To learn more about Mill Race Historical Village, you can visit their website here. something we love in the Metro Detroit area with so much automotive history around us. 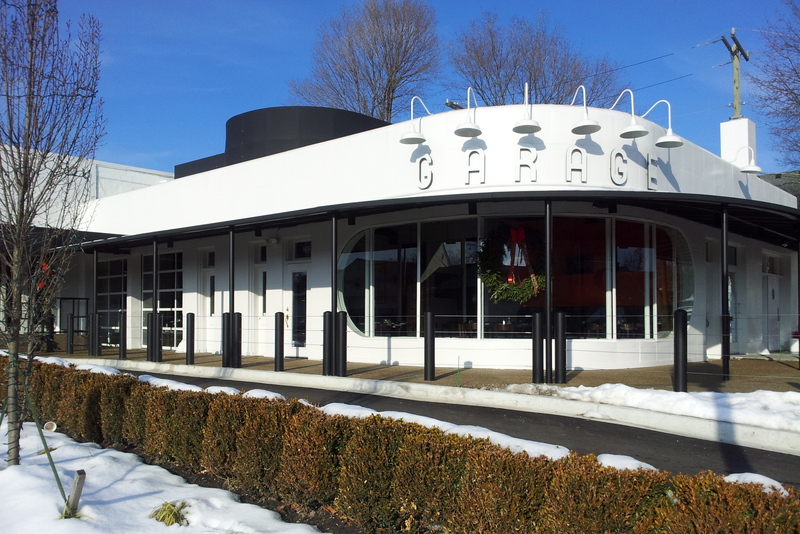 Consider the recent re-opening of the Vinsetta Garage as a restaurant in Royal Oak. This place is now a destination for automotive enthusiasts – especially during Dream Cruise weekend. To learn more about the repurposing and renovation of Northville’s Garage Grill and Fuel Bar, here is a great video showing the work in progress from earlier this year. Garage Grill and Fuel Bar is located at 202 W. Main St in Downtown Northville. The menus is extensive featuring sandwiches, pizzas, seafood, and beef. There is usually a wait so you should call ahead (248-924-3367). We really enjoyed our dinner there – the food, service, and setting were all excellent! What a great example of honoring the past while repurposing for the present. One issue that many downtown Northville and Plymouth businesses face is the availability of nearby parking for customers and employees. Although it’s usually possible to find on-street parking during the daytime, evenings can be difficult. And as new businesses continue to open or expand with sidewalk cafes, etc., the demands on available parking continue to increase. In downtown Northville, there is a new walkway under construction that provides better access to Main St. from a large surface parking lot. Due to open in several weeks, the covered walkway will be a welcome convenience to all those that frequent downtown Northville’s shops and restaurants. 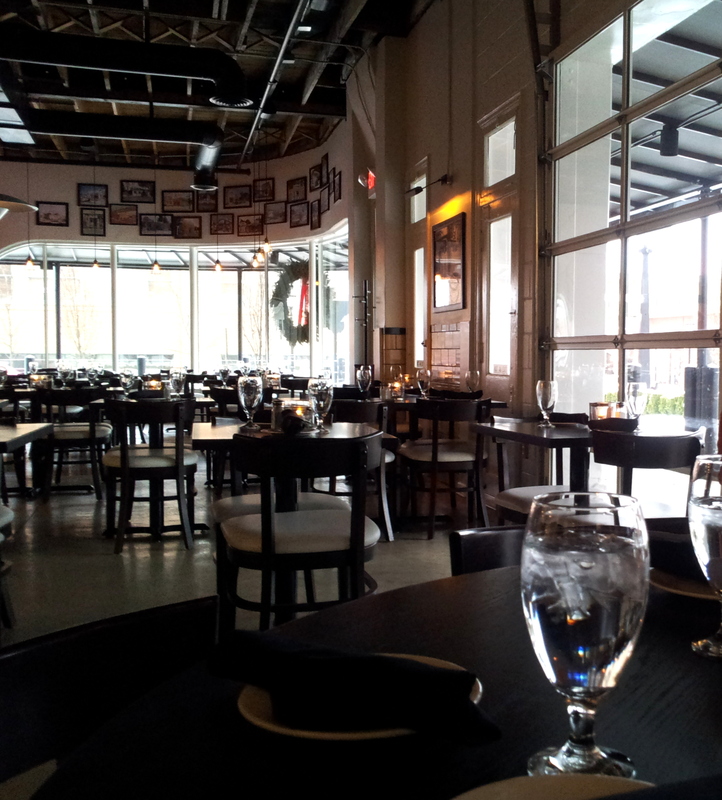 We finally managed to try out Brick’s in downtown Northville and came away with a fairly positive first impression. The design, service, and food were all quite good and appropriate to the sports bar genre in this downtown location. For warmer months, there’s a spacious elevated, outdoor seating area as well. Inside, there’s plenty of TVs which provide the ‘ambiance’. Located at 133 West Main St., the restaurant is directly across from Re-Purpose made famous by HGTV’s Cash and Cari. Look for more HGTV activity soon in nearby downtown Plymouth…. For more informatin about Brick’s, call them at (248) 924-2135 or visit their website at www.bricksofnorthville.com. Just sold, this immaculate 3 Bedroom, 2.5 Bath, 2021 Sqft. condo within easy walking distance to downtown Northville. 312 Buchner Hill in the Mountainview community offers a serene tucked away setting on a Northville hilltop. To see similar homes, please visit our Plymouth and Northville Real Estate homepage at www.bobbake.com and then contact Carrie, Plymouth and Northville Associate Broker, at 734-788-2398 – carrie@bobbake.com or Patrick, Plymouth and Northville REALTOR,at 734-272-8375 – patrick@bobbake.com. There are plenty of events and activities throughout the year in Northville but as Hallowe’en approaches, some unique experiences present themselves. The Cemetery Walk at Historic Oakwood Cemetery takes visitors back in time with costumed citizens sharing stories about life in the early days of Northville. For more information about this event, click here. Updated January 13th, 2010: it’s been several months now and Le George continues to impress. We stop by there for lunch quite often and the service is always top notch. Ask for the recommended specials which we do or just go for a sandwich. Update August 13, 2010: Le George is now open! If you are looking for an upscale bar/restaurant specializing in Middle Eastern cuisine, Le George might be worth a try. The interior is very nicely decorated and there’s even an outdoor seating area! We had lunch there today and the place was very busy. There is also a convenient take-out menu if you are on the go. For more information, call Le George at (248) 924-2016. Walking in downtown Northville today, we noticed the new Le George Mediterranean Bar and Restaurant under construction. The sign on the window suggests a Spring 2010 opening so let’s look forward to a new business downtown. le George is located at 124 E. Main St. in downtown Northville. Here’s a video about the City of Northville Michigan that I thought would be worth sharing. It gives a very good overview of the City and what you can expect to find living here. Whether it’s the Town Square, theater, galleries, stores, restaurants, race track, walkable tree-lined streets, and historic homes, you’ll find something to enjoy in this classic American small town.